Every arts organization has a deficit, NOT! I am afraid NOT every arts organization has a deficit. That is simply not true. And it is dangerous logic. This is a good counterpoint to the fact that not every popular entertainment institution is profitable or sustainable. Until we can get past specific stereotypical qualities we attribute to arts organizations and popular music institutions, we’ll never be able to start seriously figuring out why some things work and why others don’t. Symphonic Job listings on Craigslist? 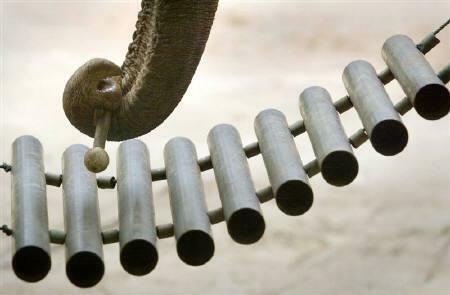 Elephant in the Room: Everything That’s Wrong With Orchestras? OK, I’m going to discuss the elephant in the room. Symphony orchestras and conductors are OBSESSED with historical music. Orchestras are “musical museums” that do not have the contemporary connection to society that painting, sculpture, books, plays and film do. In other art forms new creation is welcomed, but in the orchestra world it is met with disdain. Every aspiring conductor and soloist wants primarily to put his or her stamp on the same historical masterpieces that have flooded symphony programs for at least the last 75 years. Yes, there is the occasional commission of a low-hanging big name, but it is telling when an orchestra that “dares” to perform as few as three works by living composers in the same season receives an award for “adventuresome programming.” Ha! Some adventure! Since all orchestras are performing essentially the same rep, every city no longer needs one. Better performances are available on CD or on iTunes for a fraction of the cost of attending a live performance. Insiders may get their jollies from this year’s crop of hot artists playing the same concerti, but the general public has no more interest in this that they do in seeing different casts perform plays like “Our Town” over and over. If movies were like orchestras, we would be offered mostly vintage films like Citizen Kane and Gone With The Wind. If bookstores were like orchestras, rows of shelves would be dedicated to Dickens, Longfellow and Tolstoy, with a handful of books by Steinbeck in the “Contemporary” section. All of these entities would be sure they were doing “the right thing,” all would insist that what they offer is what their patrons want, and all would spin in circles trying to “raise awareness” while they slowly went broke. There’s loads of fine contemporary concert music available – not pop, or jazz, or rock, but real art music by trained and skilled composers – but orchestras will die before they make any moves toward being culturally relevant. And die they shall! There are so many things I want to say about what’s wrong (and what’s right) about the above that I just don’t have the time. I’ve made some comments in that thread, but also at my facebook fanpage here. But for the most part, I don’t think this post by Drew McManus needed to be the forum for Stephanie Wilson to air her beefs with modern orchestras programming, but there it is–the so-called elephant in the room to her and others who feel like classical music is a dead or dying institution. This comes after the LOI decision and announcement to hire replacement musicians for the orchestra. So much news this past week that I can’t hope to summarize the situation right now. Here is the piece in the Courier Journal. 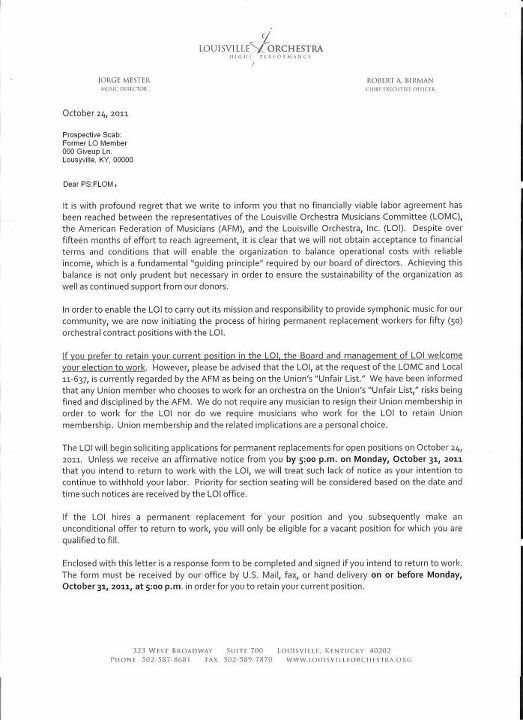 Also, notice the image to the left–a copy of the letter sent to the current musicians (that’s a bit misleading as the musicians aren’t under contract right now). It’s a bit edited but you get the point, I think.